Gaijin has shown its players a lot in the last couple of days. As it has been confirmed, Japanese Ground Forces will arrive in the upcoming 1.65 patch. Gaijin has decided to share some of the more interesting vehicles for players to toy with upon their release. 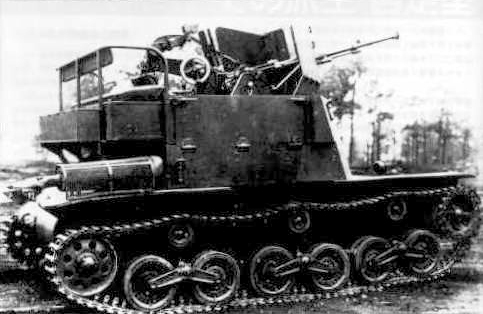 Today we will go over the first Japanese anti aircraft tank shown by Gaijin, and what will be one of the first SPAAG’s available to the Japanese, the small but deadly So-Ki. As far as back as the early 1930's, Japan had been experimenting with anti aircraft mounts on multiple testbeds. From railroad cars to trucks, cars, horses, and especially tanks. In 1938 it was decided to design a new self propelled anti aircraft tank to accommodate the Imperial Army's needs of having a mobile anti air vehicle to aid in protecting troops and armored convoys. The first design that was built was based on a modified Type97 Te-Ke chassis mounting a single Type98 20mm cannon. Under trials, the vehicle was found to be too unstable and could not accurately hit targets. While two prototypes were constructed, the vehicles were scrapped after trials. The Type98 had been the standard light automatic AA cannon used by the Japanese, but due to its low range, the cannon could not hit targets at high-altitude. However, development of SPAAG’s that could accompany tank units to offer protection from air attacks had not been abandoned. The idea of a mobile anti-aircraft vehicle was given a second wind with the production of the Type2 20mm light anti aircraft cannon. This was a modified Type98 light AA cannon with enhanced muzzle velocity and range. 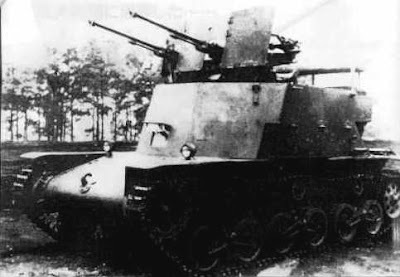 In 1941, Japan decided to retry producing an SPAAG based on an already existing tank platform. The platform which was chosen for the SPAAG was the newly built Type98 Ke-Ni light tank. Two designs were made using this platform, one with open dual mounted 20mm cannons and the other with a single 20mm cannon mounted in a turret. Both designs were labeled as prototype anti aircraft tanks. The dual mounted prototype (second design) received the designation So-Ki, whereas the turreted design received the designation Ta-Se. The Type98 Ke-Ni hull had been altered substantially during the development process, even more so for the second prototype than the first. The turret and roof plating were removed from the Ke-Ni in order to install a superstructure for the tank. While the new plating added kept the original shape of the tank, the new superstructure was somewhat larger. The driver’s position was near the center in the front of the tank, while the AA mount was placed above and behind. A gun-shield was added to offer the gunner protection from small arms fire. In addition, an armour plate was welded on the forward end of the driver's position. The side and rear armor were arranged vertically. A bench for the crew was mounted on the rear of the platform. This bench could also be folded inwards to create a container that could hold up to 20 magazines for the cannons. The total ammo complement was 22 magazines (assuming the cannons were already loaded). The So-Ki performed well when it came to the gun performance. The Type2 cannon had performed tests with a recorded muzzle velocity of 900 m/s for its AP-T shells, an improvement over the Type 98's muzzle velocity of 830 m/s. However, upon further research into the Japanese National Archive, I have came across a 92 page report detailing the differences between the Type98 and the Type2 cannons, with some graphs reporting the muzzle velocity for the Type2 cannon to reach 970 m/s with it’s AP-T shell. However this is still being looked into as it takes time to process every page word for word. [12/7/16]. The prototype, while successfully tested, was not accepted into service. This was due to the lack of available resources and the restrictions even the improved SPAAG faced. Japan by this point in the war would have needed significantly better gun performance with a higher fire ceiling than that of the Type2 or the Type98. A common mistake that many tend to make is with the name of this SPAAG. The tank is known as the So-Ki, yet many have confused it with the Type 95 So-Ki, an armored railroad car. The two vehicles are not related. The So-Ki in this case stands for Sokosha, or armored vehicle / car as its chassis is taken directly from the Ke-Ni. The Type 2 20mm also has the nickname Soki, which is not accidental as this gun was developed first for the So-Ki SPAAG. If only I had this about 8 hours earlier :) Great article as always mai! Great work as usual! Getting more and more excited for the release of the tanks! [WT] Japanese Ground Forces Arrived.